The decimal numbering system In our daily life we constantly use the numbers. Can you imagine a world without numbers? Think for a moment how we would live if there were no numbers. We use them to count, to express the result of a measure, to perform calculations ... Even numbers used to encode information as diverse as: text, images, sounds, videos ... Throughout history, civilizations used different numbering systems. Some of them, like the Roman or sexagesimal of ancient Babylon, there are still some traces in our society, yet is written in some cases the year MMX or time 18:56, for example. Our current numbering system is a positional decimal system. We say that is because the positional value of a digit depends on its place in the number: the first number 7 757 not worth the same as the second 7. The value of the second 7 is seven units, but the value of the first 7 is 700 units. We say that is because ten decimal units of a particular order equivalent to a unit of higher order. So, ten units are a dozen; ten scores are one hundred ten hundreds form a thousand, etc. Therefore, a number is equal to the sum of the products of their numbers for their respective values. For example, the number 75,269 can be decomposed as follows: 75,269 = 70,000 + 5,000 + 200 + 60 + 9 = 7x10.000 + 5x1.000 + = 2x100 + 6x10 + 9 To represent numbers less than the unit used the same equivalence relations between units orders, but now in decreasing order. Thus arises the tenths, hundredths, thousandths, ten thousandths, etc. We can also decompose a decimal number analogously as we did before. For example, the number 72.483 can be decomposed as follows: 72.483 = 70 + 2 + 0.4 + 0.08 + 0.003 = = 7x10 + 2 + + 4x0,1 + 8x0,01 3x0,001 The abacus is an instrument for understanding the relationship between units of different order very well and also perform simple arithmetic operations. In some countries, despite the advent of electronic calculators, it is still quite common to see people doing some calculations with the abacus. 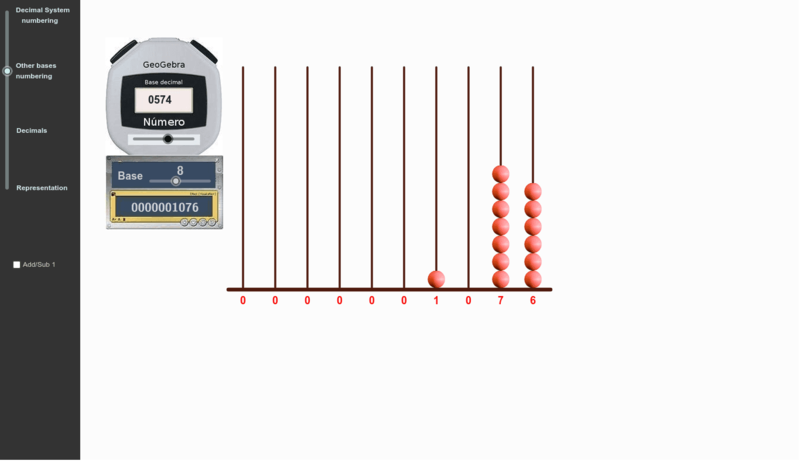 In its simplest form, an abacus is a device consisting of a horizontal base with various vertical rods, which "accounts" (perforated rings or pellets) are inserted. Each rod corresponds to an order of units: When a rod 10 gather accounts are removed and replaced by a ring or ball onto the blade on your left. There are other various positional decimal systems. In computing, for example, binary, octal and hexadecimal systems are used. In the binary system, two units of an order equivalent to a higher order, so it is a system that uses only ones and zeros. In octal equivalence between units is 8. In the hexadecimal system, 16 units of an order equal to a higher order, so 16 digits are used: ten decimal system the letters A, B are added, C, D, E, and F.
It represented on the abacus and make the breakdown of the numbers below. Check your result by checking the box "Show decomposition" 23,785 Thirty 1420. Write the number that corresponds to each of the following decomposition. Check your results with the application: 7x10.000 + 5x1.000 + 6x100 + 5x10 + 7 3x10.000 + 8x1.000 + 3x10 + 3 2x10.000 + 5x100 + 3x10 + 8 - [url=http://tube.geogebra.org/material/simple/id/489069]Zulma Elizabeth Zamudio[\url] Feature addition: The ability to add or subtract 1 to the last digit in the display; this features allows users to simulate some computer simulations concerning place value on different levels.